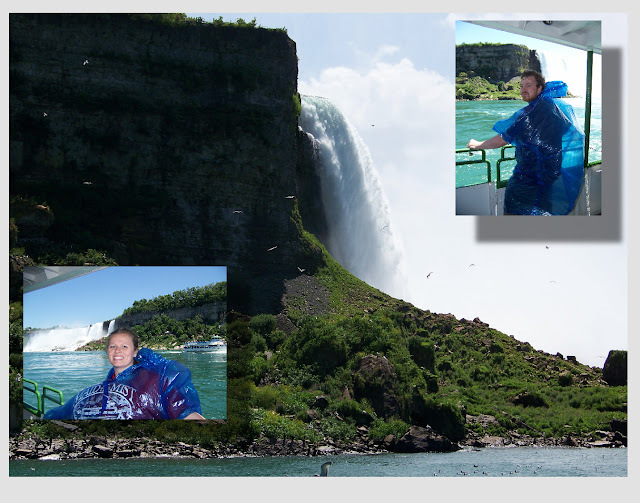 We decided a few days a go to take a trip over to Niagara Falls since, really, how often are you within driving distance of Niagara falls? We had both been before, but not for years, and not together. So on Tuesday, we hopped in the car and drove the 3 and a half hours from Pulaski to Niagara. We didn't have our passports with us so we stayed on the American side, which was great for me since I hadn't been to the American side before. We grabbed a map and headed over to the sky deck and the maid of the mist. We picked a great day because there wasn't any sort of crowd and so we didn't have to wait in lines anywhere. After a trip on the Maid of the Mist, we walked through the Park and made our way over to the Cave of Winds. Here we got to basically be in the waterfall, which was pretty awesome and pretty wet. Below you can see a snapshot of our day.